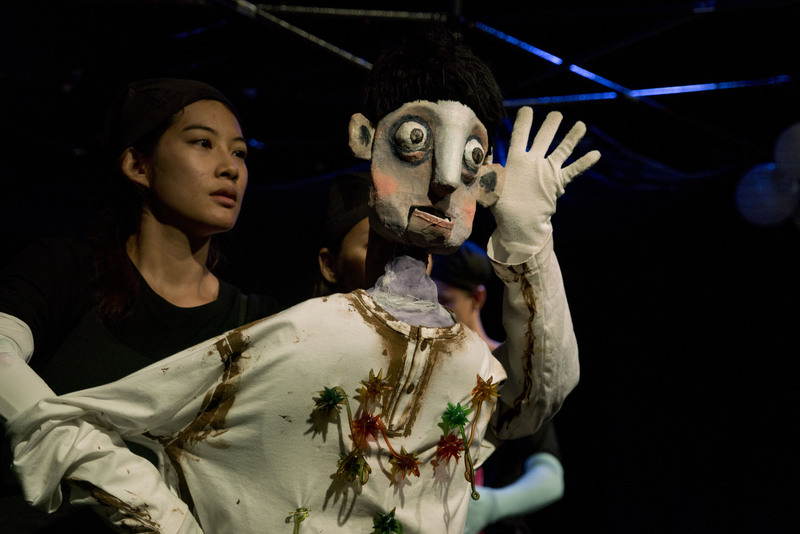 Fishy Clouds, a puppet theatre show, was created to engage communities in Thailand with issues of antimicrobial resistance and research with children. The show uses visual storytelling to bring the research and behaviour around antimicrobial resistance to life for a broad range of audiences across different ages, locations, levels of education, and language. Caption: A video showing scenes from Fishy Clouds and interviews with its makers and audiences. Fishy Clouds ran for twelve shows during the months of November and December 2016 in schools, hospitals, theatres and health centres. The show was performed in Bangkok and in the greater Mae Sot area in the Tak district of Thailand. Approximately 1500 people watched Fishy Clouds with the audience spanning children, scientists, theatre goers, and migrant Burmese and Karen populations. Due to the vast and varying target audience, non-verbal life size puppets were combined with live music and audience participation to create a narrative that could be understood and related to in different contexts. The story, about the proper use of antimicrobials and consenting to involving children in research, enabled all audience members, regardless of language, to connect to the narrative and be moved by the situations and characters it presented. Caption: Phaik Yeong Cheah, Mahidol Oxford Tropical Medicine Research Unit, Thailand, describes the Fishy Clouds puppet theatre show project which engaged communities on issues of antimicrobial resistance and research with children using non-verbal narrative techniques. Fishy Clouds was devised by B-Floor Theatre with scientific guidance from Mahidol Oxford Tropical Medicine Research Unit (MORU). B-Floor interviewed both scientists and the community, including farmers who use antibiotics in agriculture. The result was a performance that was accessible to both adults and children, and those with and without scientific knowledge of antimicrobial resistance. In order to supplement the non-verbal narrative, a leaflet was handed out at the start of the show to explain the basics of antimicrobial resistance and introduce the audience to the characters on stage. The venues were selected by both MORU and B-Floor with the aim to reach as wide an audience as possible. Both adults and children, scientists and laymen, migrants and health care workers, those who go to theatre regularly and those who have never been, were targeted to better understand who most benefits from this type of medium. After each show a feedback from was distributed and collected from the audience which asked their opinions on the performance, and the science messaging in the show. Nearly 1000 feedback forms were received in total for quantitative analysis. Qualitative data from 25 interviews of audience members and stakeholders, and three focus group discussions with healthcare workers and audience members will be used to complement the quantitative data analysis. A full evaluation report will be created with the results and interpretation of this data analysis. Data will be investigated to assess against eleven outcomes within two broader hypotheses; whether Fishy Clouds can stimulate pro-active thought processes to increase awareness of antibiotic use and research with children, and secondly, if Fishy Clouds facilitates a sense of enjoyment among the audience creating a worthwhile and sustainable product. With the passing of King Bhumibol Adulyadej of Thailand, and the resulting nationwide mourning period, the initial performances of Fishy Clouds had to be delayed. This proved challenging to cancel and reschedule these performances, and in fact meant that a key show at a festival was missed. Because the audiences included Thai, English, Burmese and Karen speaking people, we had to have four different versions of the feedback forms which was a logistical challenge and included the help of many translators. Interviews also needed to be translated, both as the interviews were being conducted and afterwards for analysis. The play itself was visually strong but in early conversations with audience members there was a feeling that the narrative could have been challenging for some viewers to understand. In response to this, a very basic synopsis was created in Thai, English, Burmese and Karen and was distributed with the leaflet at the start of each show. Since Fishy Clouds was a pilot project we anticipated challenges from the start, and hence had to have a flexible and adaptive approach. We learnt very early in the project that to get the best results we would have to continually evaluate best practice after each performance and thus treated each new show and each new audience with fresh eyes. There was no ‘one hat that fits all’. We had a strong team of translators, evaluators, data managers, producers and artists who worked efficiently, and at short notice to mobilise any new resources we thought necessary such as printing and translations. Once the data is analysed we will share any results, looking at whether theatre is an effective way to engage with the community. Furthermore, we will also evaluate which populations best benefit from this approach and what messaging is valued in the performances. This data will be valuable to not only MORU and B-Floor, but other researchers interested in similar projects. Fishy Clouds, was funded by the Wellcome Trust and a collaboration between the Bioethics and Engagement Department of the Mahidol Oxford Tropical Medicine Research Unit (MORU) and B-Floor Theatre. Hi everyone, please let me know if you have any questions. Happy to share our experiences, challenges and lessons learnt.